Directly on the sea, just cross the street! The Euro Hotel is a 3 star family run hotel located in front of the beach of Bellaria Igea Marina. It has a heated outdoor pool with hydromassage and solarium space. Particularly suitable for families, offers services for children and has parking, air conditioning and WI-FI for free. Pets of all sizes are allowed. 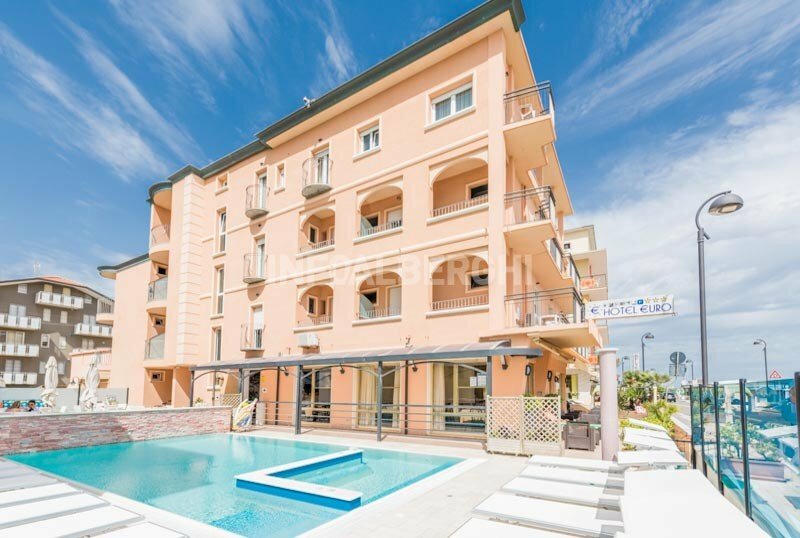 The structure is located in front of the sea in a central position from which you can reach in a few minutes on foot the marina and the pedestrian area of Bellaria, about 15 minutes away and full of shops and restaurants. The rooms have a balcony overlooking the sea, air conditioning and heating, satellite TV and digital terrestrial, free WI-FI, safe, minibar on request, telephone and bathroom with hairdryer and shower. Heated outdoor pool, Jacuzzi, sun terrace and open-air porch. Inside there is a reading room, a spacious hall with a TV and a bar, and newspapers in consultation. The hotel is equipped for cyclists and has free bikes. We organize theme nights, beach towels in use. PARKING : covered with limited places; discovered and available to all customers. CONVENTIONS : beach, amusement parks, discos, gym, free shuttle service at trade fairs, organized excursions for a fee. BREAKFAST : international buffet breakfast with a rich selection of homemade cakes. LUNCH AND DINNER : risotto à la carte, 3 first and 3 seconds of Romagna tradition, with fish dishes every day, always accompanied by buffet of cooked and raw vegetables, and various snacks. VARIATIONS : the menu is suitable for vegetarians. In the hotel : outdoor playground area, strollers, bicycle seats and afternoon snack, entertainment service. Baby sitter and pediatrician services are available on request and at an extra cost. In the room : cots at no extra cost, fall protection rails and camping cots. With meals : for the little ones the meal times are flexible and the restaurant has seats at the table, baby food and baby menu (with vegetable soups, vegetable broths and pastries), bottle warmers. The hotel has a heated swimming pool overlooking the beach and has a hydromassage bath. Around the pool there are sun loungers and a terrace with chairs and tables. In summer the staff organizes parties and aperitifs by the pool. The hotel has an agreement with the "Bagno Gino n.59" bathing establishment, equipped with sunbeds, beach umbrella, showers, beach volleyball courts, tennis courts and bocce. In addition, we organize water aerobics classes, sports in the gym, sports tournaments, Latin American dances and water sports such as sailing and windsurfing. Prices are per day and per person in a Superior Room, for a minimum of 3 days in Classic Formula. CLASSIC FORMULA: Full board with water, local wine and soft drinks. - Meals not consumed will not be deducted. In our small family-run hotel, children up to 2 years old are always free. Excluding Easter Weekends and Holidays. From April 1st to May 31st. Formula B & B starting from 25.00 euros per day per person. cold cuts, jams, yoghurt, brioches, biscuits also without gluten, biscuits, homemade cakes, fruit juices and hot drinks. Contact us now to receive a specialized quote. Special price for Easter 2019 for stays in a double room in full board. Full board with drinks at meals! Rich menu based on fish, home cooking cured directly by Silvia.